Dunn Construction was issued a subcontract for this project with a strict contract duration time. Our scope of work consisted of two 3-inch-thick asphalt lifts, which were installed as part of the overall twenty-inch buildup of the proposed interstate concrete paving. The work required huge efforts from our asphalt plant facilities at both Lakeshore and Longview. Our portion of the project, over 28,000 tons of asphalt was manned with varying asphalt crews running day and night in order to keeping the project on schedule. Safety was the project’s primary challenge, given the number of separate contractors working simultaneously—both on the highway shoulders and on lanes within the highway. Given its critical location (one of the busiest sections of interstate in the state of Alabama), the highway remained open to traffic throughout the duration of the project. This challenge led to scheduling which juggled considerations for traffic shifts—while also undertaking concrete demolition, grading & drainage improvements and soil modification; all before the actual concrete rehab work could even begin. 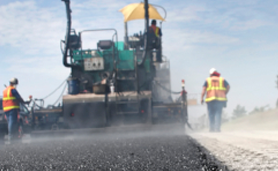 All finished work was held to uniquely strict specifications guidelines for quality assurance, asphalt thickness and yield and to maintain the demanding schedule. The project was completed on time in December 2011.